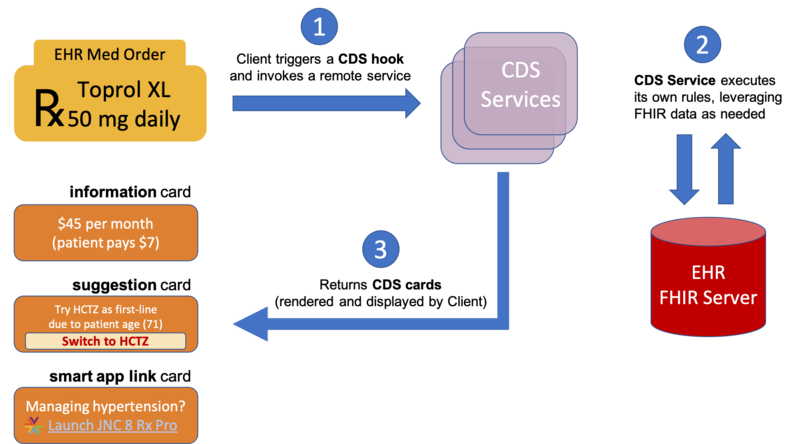 When a triggering activity occurs, the CDS Client notifies each CDS service registered for the activity. These services must then provide near-real-time feedback about the triggering event. Each service gets basic details about the clinical workflow context (via the context parameter of the hook) plus whatever service-specific data are required (via the pre-fetch-template parameter). suggestion card: provides a specific suggestion for which the CDS Client renders a button that the user can click to accept. Clicking automatically populates the suggested change into the clinician's UI. An OpenAPI Specification (formally known as the Swagger Specification) interface of CDS Hooks is available. Using the CDS Hooks OpenAPI specification, you can generate client or server code to help you get started with your implementation. You can download the API specification and view it online via the Swagger Editor. CDS Hooks implementers are not required to use the OpenAPI Specification interface of CDS Hooks.